Brisket is one of those cuts of beef that really can benefit from a long cooking time. Slowly melting away the connective tissue within the meat takes time and can turn a chewy cut of beef to one that melts in your mouth. This slow cooker version is a perfect way to cook this. While there are a lot of ingredients, they mostly all get dumped into the same pot. You couldn’t keep this together if you tried. Some of the best eats around! 1. 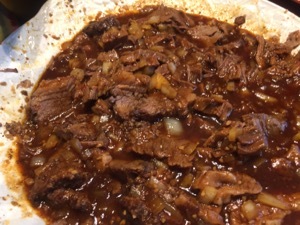 In a large resealable plastic bag, combine the Worcestershire sauce, chili powder, bay leaves, garlic, celery salt, pepper and, if desired, liquid smoke. 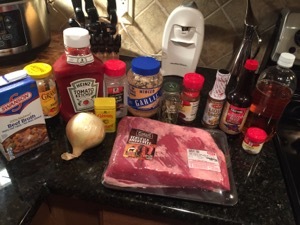 Cut brisket in half; add to bag. Seal bag and turn to coat. Refrigerate overnight. 2. Transfer beef to a 5- or 6-qt. slow cooker; add broth. Cover and cook on low for 6-8 hours or until tender. 3. For sauce, in a small saucepan, saute onion in oil until tender. Add garlic; cook 1 minute longer. Stir in the remaining ingredients; heat through. 4. Remove brisket from the slow cooker; discard bay leaves. Place 1 cup cooking juices in a measuring cup; skim fat. Add to the barbecue sauce. Discard remaining juices. 5. 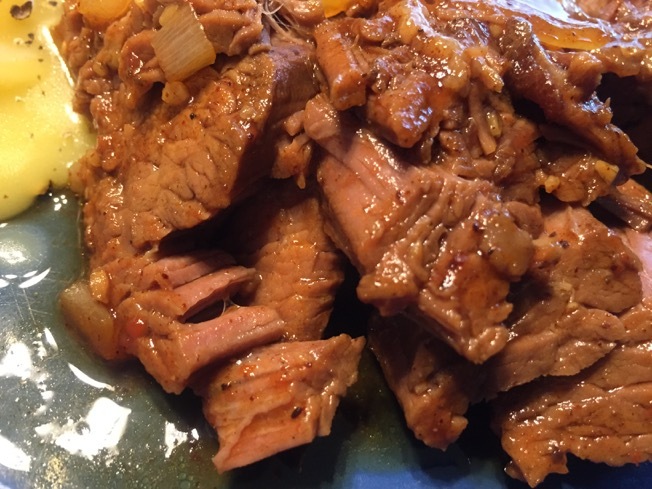 Return brisket to the slow cooker; top with sauce mixture. Cover and cook on high for 30 minutes to allow flavors to blend. Thinly slice beef across the grain; serve with sauce. Yield: 12 servings. 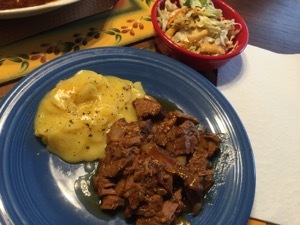 Nutritional Info: 6 ounces cooked beef with 1/4 cup sauce equals 381 calories, 12 g fat (4 g saturated fat), 96 mg cholesterol, 548 mg sodium, 18 g carbohydrate, 1 g fiber, 47 g protein.